A random little piece of writing from many years ago. Welcome to the internet, random little piece of writing. Enjoy your time here. I hope someone enjoys you. The story begins in a far off land full of magic and mystery. Stories usually do. No adventure ever starts in our own repetitive little world. No one would read it if it did. Imagine you are floating high above the clouds. Above you is a clear blue sky and below, a billowing landscape of white. Watch as you accelerate downwards, passing through the clouds, feeling their soft dampness caress your cheek. Once through the cloud there is nothing but forest below you, the leafy canopy stretching as far as the eye can see. Two figures move through the forest, one running, one chasing. The first is female, her feet bare. 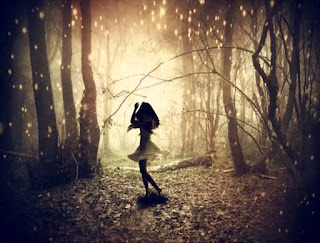 She is clad only in a flimsy white dress that sweeps along the forest floor as she runs. Her face is flushed with her speed, but her smile is wide. She passes by without seeing you. Minutes later, the second figure arrives. He looks much older than the girl, and his breathing comes in gasps. He wears what was once a smart suit, but now it is ragged and soiled. There is a gaping wound in his left leg. He staggers into the distance, limping. It is night. A bright full-moon shines down from a cloudless sky. You are in a small clearing, surrounded by trees. The girl is sitting, naked and motionless, in the centre of the clearing, her arms hugging her knees to her chest as she stares up at the moon. Her only expression is one of fascination. She appears unaffected by the harsh coldness of the night. He is getting closer, she can feel that, and soon he will be here. She knows he will follow her. They will meet, face to face, at this very spot. Her expression breaks and a girlish giggle escapes from her lips, sounding loudly in the silence of the forest. She stands. Her arms raise and her legs kick, and she begins to dance, around and around the clearing, faster and faster... laughing, singing, crying with joy. The man has arrived. He stands alone in the centre of the clearing, waiting for the girl to emerge from her hiding place. She has watched him arrive and has circled around until she can creep up behind him undetected. Now she advances, eyes always upon him. Her naked feet pad silently across the cold, damp grass and if he hears her, he makes no sign. She stands directly behind him and giggles in delight at the thought of how silently she has approached him. Slowly he turns. His face is haggard, his eyes bloodshot and tired. They look at each other for a very long time. She dances once more. She is clothed now, and her flimsy dress swirls in harmony with her motion. Her hands are clasped high above her head and her expression is one of pure joy. She dances in a spiral, each circuit of the clearing spiralling further away from the man’s crumpled form that lies at the centre of her dance. He is not dead, but his body is motionless, and the collar of his jacket flaps uneasily in the gentle winter breeze.